Football fans will always have players who they do and don’t rate but with some Newcastle fans it is at the point where it changes from game to game. Shola comes on for the last ten minutes at Goodison and gets an assist for the late equaliser, I saw various fans’ comments afterwards saying we should play Ba & Shola up front and drop Cisse. 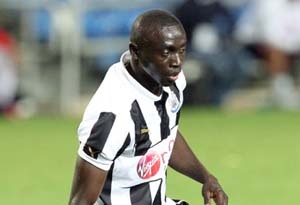 Demba Ba isn’t happy left on the bench (which is understandable) and knackers are saying we should sell him. No doubt many of these people were loving the ‘X goals since Ramadan and he just can’t get enough’ chant last season, or were agonising that we might lose Cisse over the summer. More than any other position on the pitch, strikers will have good, and not so good, spells. Players of the calibre of Ba and Cisse need the fans behind them and be allowed to play through their lean spell, particularly when we haven’t got any other strikers! Well that is strikers who will score goals, Shola has found his own niche as a late sub to close a game or occasionally make something happen but after watching him for all these years why would he suddenly turn into a goalscorer? Cisse more than anybody is an out and out goalscorer, Ba will get more involved in build up play but you need Papiss hanging onto the last defender and given time will score goals. Just like Shola – look at his goalscoring record and in a positive sense it will tell you all you need to know. It would also help if occasionally (any time) somebody else apart from Ba, Ben Arfa and Cisse could score a goal, it is allowed you know!